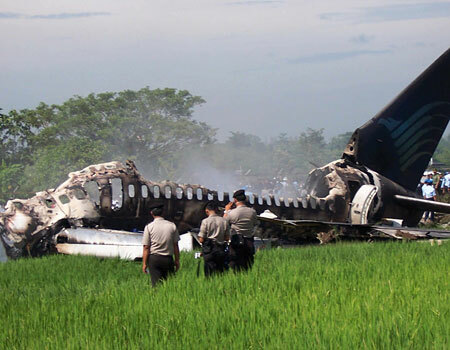 I’m sure many of you heard of todays plane crash in Indonesia. It’s an unpleasant fact of life that sometimes, planes do fall out of the sky. Which is why anytime I go to get on one, I am constantly amazed at how unprepared people are for the possibility of what might happen. They ignore the safety briefing, don’t even bother to look for the nearest exit, and *worst* of all, wear things which are not appropriate for the occasion. The reason I mention this is, I just saw footage of the crash scene with a woman clearly injured, trying to walk in heels and a mini-skirt. Not a good idea! So, a few fashion don’ts for when you next fly.. This outfit will mean you have trouble getting to the exit door, which will mean those behind you might not make it to the door at all. Nice for street-walking (literally perhaps) but no good for flying. Heels will hinder your progress. Put them in the suitcase, don’t wear them in flight. Pantihose! OH NO! Major plane fashion faux pas! The fibers will melt in a fire and stick to your skin, which is not a good look and certainly would cause a lot of pain. Just say no to pantyhose when flying. Going on a beach holiday? Save the beach dressing for when you arrive. Wearing something like this on a plane will get you talked about, and more than likely a large percentage of burns to much of your body in the event of a crash. Not a wise choice. Leave your flip flops in your luggage, because in the *very rare but occasionally it does happen* instance that you have to traverse broken metal and things on fire, your feet will appreciate that you chose to wear a real pair of shoes. Covered, closed, comfortable shoes, preferably leather. I like Doc Martens myself. Comfortable pants which are easy to move in. No flammable fabrics – though all fabrics will become flammable in the kinds of fires you will see in planes, some fabrics are more likely to catch fire than others. Denim jeans (not too tight, don’t restrict your movement) is the better choice. A long sleeve shirt to protect your arms from burns. Wool is one of the least flammable materials. Cotton is a good choice too. The idea is, to get out of the plane before you have to deal with the fire. If you are wearing sensible clothes which you can move in, its more likely you’ll be able to manage this task. Knowing where the nearest exits are will also help. But if you are injured and can’t move, wearing clothes that will protect you will be a good idea too. Anyway, that’s just a few thoughts you might want to consider when next choosing what to wear when you fly. Save the fashion for the catwalk, put it in your suitcase. When you fly, dress to survive. Even though 99.9% of flights make it safely to their destination, if your flight happens to be one where you do need to evacuate, you will appreciate dressing to survive instead of dressing for fashion. ← A lovely time was had by all..
Glamor is way overrated, I think! Just wanted to say how much I’ve been enjoying your photos. I love the flowers, the beach scenes and especially the shells. Not living on a coast, I never see stuff like this. Some really beautiful shots of the kitties as well. I bet you could be successful as an animal portrait photographer. Now there’s a thought. I assume shoes come off so as not to deflate the escape slides? But woollen socks would be preferable over nylon for the same safety factors as the pantyhose.